See you at the SUPERSALE Holiday Bazaar + Free Passes! Get your shop on at the biggest Holiday bazaar to hit the metro, SUPERSALE!!! Complete your shopping lists and your holiday outfits here, so many options! :) The SuperSale Team has gathered only the best brands in one roof to satisfy your Christmas shopping needs. From that party dress to mom’s present, you can never go wrong in our selected 200 brands of up to 90% off. Yes, Christmas is the time where prices are all marked up but we are always making an exception wherein we promise you'll make smart buys in a snap! 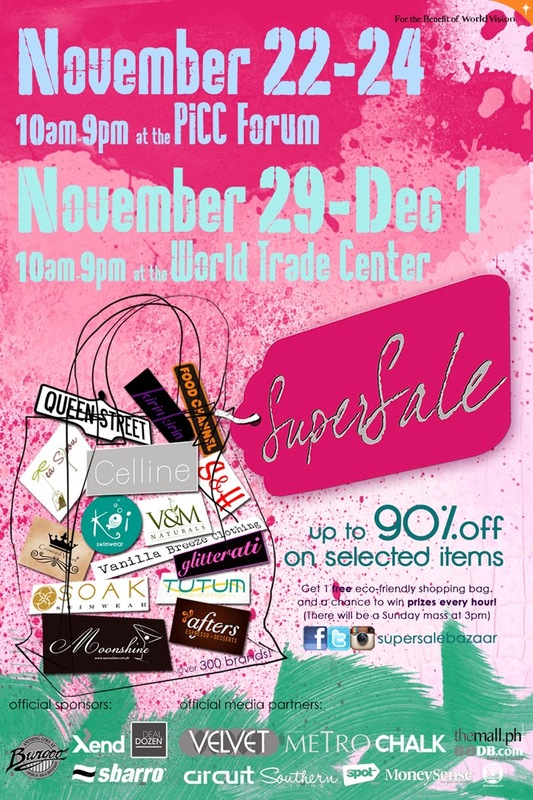 Enjoy great discounts at the SuperSale Holiday Bazaar on November 29-December 1, 2013 at the World Trade Center Hall 4 from 10am-9pm. Post on Instagram and Tweet your favorite looks and pieces to win prizes and don't forget to share which bloggers are topping your best-dressed list! Try to get a snapshot with us during both 3-day fetes. Don’t forget to follow @supersalebazaar and tag #supersalebazaar. Tons of prizes await! * For the Benefit of World Vision, helping build a better world for children. P.S. Leave your full name and email below for free passes. Don't forget to follow Supersale on facebook, twitter and instagram. Ciao!